India we see is spread over by ancient heritage of its own everywhere you will find palaces, forts, rock cut caves, temples both ancient and medieval, Colonial Buildings, the best way to explore these places are to take a tour along with guide who can guide you with the description of the buildings. The guide will take you take you to the bygone era and will help you in observing you the comfort and luxury of the royal families. We will also suggest you to experience the heritage accommodation which is now a days well equipped with all the modern days facilities. Upon arrival assistance at the airport and transfer to the hotel. Later in the afternoon proceed for Chennai local sightseeing covering the most remarkable attractions of Chennai. Visit to Fort St George of 1653 now hoses Secretariat and Legislative Assembly, St Mary’s Church the oldest Anglican Church, Sri Parthasarthy Temple built by Pallavas of 8th cen & Kapeeleshwara Temple. Overnight at hotel. After breakfast proceed for Mahabalipuram enr oute covering the sightseeing of Kanchipuram. In Kanchipuram an ancient town whose history date back to 2nd century BC which was the capital of Cholas. Visit to Kamakshi templetemples also Kanchipuram is well known for Silk weavings who believed to have settled 400 yrs ago. After sightseeing and shopping proceed for Mahabalipuram. Upon arrival hotel check in. Later visit to Shore Temple regarded as one of the oldest dating back to 8th century AD constructed in Dravidian style. The five Rathas are a group of five monolithic temples. Overnight at Hotel. After breakfast drive to Puducherry or Pondicherry. Upon arrival hotel check in and later proceed for sightseeing of Pondicherry. Pondicherry till recently was under the influence of French and occasional interruption by British and Dutch it was in 1954 that has been incorporated under Indian Union. Therefore one can still feel the French influence among here. French is still the official language of Pondicherry. Sightseeing of Raj Niwas, The sacred Heart Church and Sri Aurobindo Ashram. Overnight at Hotel. After breakfast proceed to Chidambaram upon arrival proceed for sightseeing of Chidambaram the seat of Lord Nataraj the cosmic dancer and visit to Nataraj temple the roof of the sanctum is gold plated and later proceed to Kumbakonam. Arrive hotel check in and proceed for the sightseeing of one of the oldest town is also a very picturesque town. Visit to the famous Nageshwar Temple, Dharasuram a UNESCO recognized, Kumbeswarar Temple ad Adi Kumbeswarar Temple. Overnight at hotel. One can take the Navgrah Temples Tour/Darshan which will require additional 2-3 days. Nava means ‘nine’ and ghara means planetary ‘energy’, ‘force’ or ‘controller’ so Navagraha Pooja is a prayer ritual performed to energise an individual or family according to the nine planetary forces. After breakfast proceed to Tanjore and Trichy. Upon arrival n Tanjore home to Carnatic Music and home of Music Instrument, dance and handicrafts. Visit to Brahadeeswarar Temple constructed some 1000 yrs back by Chola King Raja Raja regarded as architectural marvel. Continue your drive to reach Trichy. Upon arrival hotel check in and later proceed for sightseeing. Visit to Srirangam Island surrounded by Kaveri River water is 600 acres small town enclosed by Gigantic Walls is Sri Ranganathaswamy temple with one of the Gupuram being the largest in India. The Rock Fort situated on the bank of Kaveri River is the famous landmark having 84 m high rock and is one of the oldest in the World dating back to 3800 milllion years. The temple at the summit is 344 steps up and there is inscription dating back to the 3rd century BC. Overnight at hotel. After breakfast drive to Rameshwaram the most sacred pilgrimage center in India is among one of the four Dham of India. Rameshwaram, as it is said, is the place where Lord Rama offered thanks to Lord Shiva in return for his support in defeating King Ravana. Upon arrival hotel check in. Later visit to one of the most sacred Ramanatheswamy Temple this magnificent temple is among the 12 Jyotirlingas situated in different parts of India. The list of unique features in its construction seems to be endless. There is this huge hallway that is of approximately 1220 meters in length. Throughout the length of the hall, there are brilliantly carved pillars, the alignment of which will leave you totally mesmerized. Overnight at Hotel. After breakfast leave to Kanyakumari. Upon arrival check into the hotel. Kanyakumari is the southernmost tips of the India and the meeting point of three water bodies namely Arabian Sea to the west, Indian Ocean in the south and Bay of Bengal to the east. After check in you are free to relax this day. Overnight at hotel. After breakfast leave for Madurai. Upon arrival hotel check in and rest of the day at leisure. Madurai is known as the Athens of East. Overnight at Hotel. After breakfast take a sightseeing tour of the famous Meenakshi Temple. 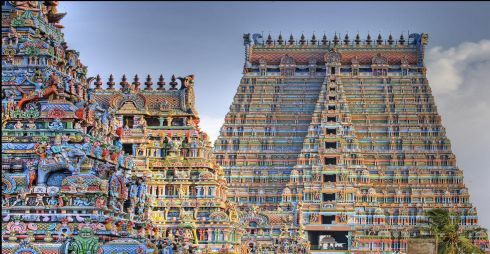 Visit this marvelous temple having the Gopuram of 48.8 m and have over 1500 sculptures. Later leave for Munnar a pictures tea town in the state of Gods own Country. Arrival at Hotel check in and overnight at hotel. Today after breakfast take a break from regular sightseeing and visit to tea Garden Estate and see how the tea is processed, also visit to Eravikulam National Park. Overnight at hotel. After breakfast drive to Alleppey. Upon arrival you will check into the houseboat. For the next 24 hours you will be having altogether a different experience as you will be gliding on the backwaters of Kerala. On board meal will be prepared by attendant. Overnight at Houseboat. After breakfast disembark from the houseboat and drive to Cochin. Upon arrival hotel check in. The Cochin has one of the best preserved heritage some of the best heritage property to experience like Bolgatty Palace and Island resort, Fort Heritage, Brunton Boatyard of CGH etc. Later sightseeing of Fort Cochin, Chinese Fishing Net, Churches and in the evening Kathakali Show. Overnight at hotel. After a 12 day discovering of South Indian Heritage it’s time to say good bye. You will be see off at Airport or railway station. • Accommodation on twin sharing basis as per above mentioned hotels or similar. • AC Car for transfers and sightseeing as per above itinerary with well-groomed chauffeur. • Anything extra not included in the above “cost includes” sections. · Women should avoid wearing revealing clothes in the temples to respect the sanctity of the local and is not our tradition. In general, both men and women should wear light pastel shades. · It’s always advisable to take guide for sightseeing and Darshan. · In some of the temples non-Hindus are not allowed hence one has to check before entering into the complex.